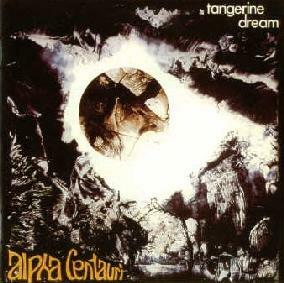 Tangerine Dream - "Alpha Centauri (Re-Mastered)"
Tangerine Dream’s major breakthrough came in 1974 with Phaedra, their first release on Virgin Records. That album’s brilliant atmospherics and sequencer driven explorations made it one of the most influential albums in electronic music ever recorded. But Alpha Centauri, the band’s sophomore effort from a few years earlier, in retrospect, was one of the first true space rock albums ever recorded. Tangerine Dream’s debut, Electronic Meditation (1970), was inappropriately titled. Not really incorporating any electronics, and presenting less than meditative music that ran over familiar ground already covered by Pink Floyd and the Doors, it demonstrated nonetheless the band’s desire to explore the realms of the new experimental rock emerging in the late 60’s and early 70’s, music that went beyond psychedelic pop and blues based acid rock into free form territories of improvisational madness. But after Electronic Meditation, Tangerine Dream nearly fell apart. Flute and cello player Conny Schnitzler left to hook up with Kluster, and drummer Klaus Schulze left as well, switching to keyboards and joining Ash Ra Tempel for a brief stint before starting his own highly influential solo career as an electronic artist. Remaining founding member Edgar Froese was undaunted. Recruiting organist Steve Schroyder and 16-year old jazz drummer Christophe Franke, he set about to re-tool the band’s sound. Franke had acquired one of the new VCS3 Synthesizers, which proved to be a pivotal addition to the band’s arsenal of instruments. For the first time, Tangerine Dream began using sustained electronic sounds as an integral part of their sonic output. Throwing every rock convention out the studio door, the trio recorded Alpha Centauri in 1971, and emblazoned it with the significant and defining dedication, "...to all people who feel obliged to space." The mood of the album was much darker than almost anything else being recorded at the time. The intense, crackling and whooshing gasps and shrieks of the VCS3 gave the whole project a truly alien feel. Sunrise in the Third System set the tone, with its slow build of stately organ chords, low-key guitar, and eerie melody. There were no drums on that opening piece; they would be saved for the next track. Fly and Collision of Comas Sola stretched out to 13 ½-minutes, beginning with the wailing VCS3 swirling about, fading in and out, as Froese began a slow strumming with his electric guitar, and Schroyder joined in with creepy space organ. Over it, guest player Udo Dennebourg played a haunting flute improvisation. As the shrieking space sounds grew to a frenzied pitch, Franke’s drumming entered the scene, wild and full of incredible energy, reverberating through the music like the engines of some vast spacecraft, with Dennebourg’s flute rising above it as the band jammed to a crashing conclusion. The rest of the album was dominated by the title track, a 22-minute total space excursion that was imbued by a remarkably otherworldly ambience. Ringing cymbals; distant, echoing flute; sighing, moaning organ and synthesizers, and all sorts of unidentifiable sounds creeping in and out of the mix (Froese is credited with playing “coffee machine”!) all coalesced into a dark and dreamy vision of a remote world bathed in the strange light of an alien sun. Castle Music has re-mastered this classic album, and issued it with Froese’s original dark and trippy cover art. The packaging also includes detailed liner notes by Paul Russell exploring the origins of the album. Also included is the bonus track, Ultima Thule Part 1, a single released around the same time as the album. It’s a blistering guitar based space rocker in the Hawkwind vein, with terrific organ and manic drumming. While I can say without reservation that Alpha Centauri is essential to any space rock collection, I’m a little hesitant in recommending the Castle re-master. I’m sure they did the best with what they had, but it’s clear that the original master tape of Alpha Centauri has sadly seen better days. There are small glitches here and there, most notably a soft, but annoying clicking for the first couple of minutes of Fly and Collision. Also, it sounds like the tape has become over saturated with time. Some of the heavy organ drones hum and buzz a little too much at higher volumes. Overall though, the sound is no better or worse than my old vinyl copy, which I happily enjoyed listening to up until I picked up Castle’s re-master, so I guess I can’t complain that much. Castle Music is a label of the Sanctuary Records Group. Their web site is at: http://www.sanctuaryrecordsgroup.co.uk.